"Here's an example of how I would convince the public that pumpkin is great for any time of the year. Ironically, I did this because I had leftover pumpkin from Thanksgiving." Whisk together 1 3/4 cup flour, 1/4 cup sugar, baking powder, baking soda, and salt in a large bowl until combined. Mix butter into flour mixture using a pastry cutter until the mixture resembles coarse crumbs. Make a well in the center of the flour-butter mixture. Stir in pumpkin puree, buttermilk, and pine nuts until just combined. Sprinkle a work surface with 2 tablespoons flour. Turn out dough onto the floured work surface. Shape into a rectangle about 1 inch thick. Fold the rectangle in thirds, sprinkle with more flour as needed, and flatten to about 1 inch thick. Repeat 2 more times. Cut final rectangle into 6 equally-sized squares. 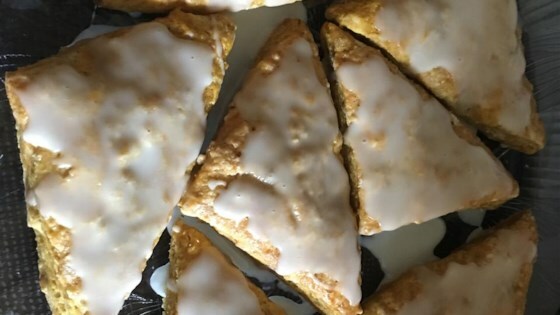 Cut each square into triangles and transfer the scones to the prepared baking sheet. Whisk egg and milk together in a small bowl. Lightly brush the top of each scone with egg wash. Sprinkle 1 teaspoon sugar over scones. Bake in the preheated oven until golden brown, 15 to 20 minutes. Transfer to a wire rack to cool completely. Make a simple glaze for these scones by whisking together1 teaspoon milk, 2 tablespoons confectioners' sugar, and 2 teaspoons maple syrup until smooth. You may need to add some more milk or sugar, depending on how thick you want the glaze.